They emitted a strong electrostatic field designed to disrupt the electrical circuits of conventional aircraft causing enemy planes to falter, dive, and crash. A few disc crafts other than Schrievers early attempts were constructed and flown. About 18 months before the Germans surrendered, the lookalike alien Hitler pinned his hopesand those of Germanyon the incredible potential of a mind-boggling array of superweapons. The greatest of the weapons were his new class of Vengeance weapons. The old V-weapons were the rocket plane V-1 and intercontinental missile V-2. 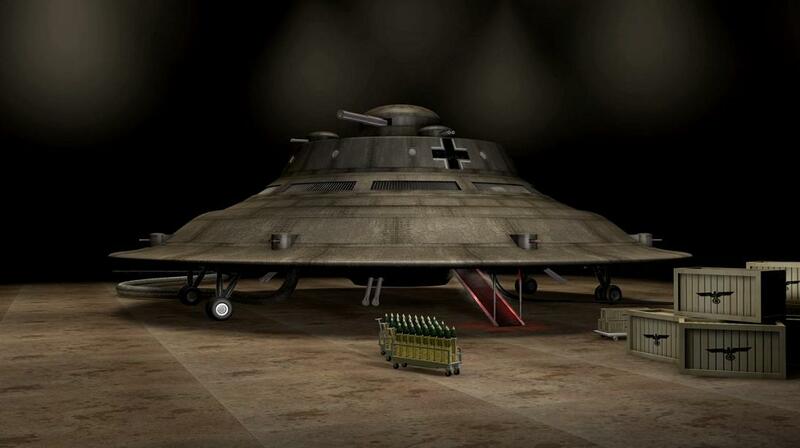 The alien technology of Hitlers original dream and then his alien double envisioned the worlds first cruise missile: a V-3 sub-orbital, intercontinental hypersonic rocket (Snger 'Silverbird') capable of hitting New York and Washington. S.S. Reichsfhrer Himmler recommended S. S. Gruppenfhrer Hans Kammler to head the saucer projects and save the Fatherland. Later Kammler is said to have overseen the "Glocke" project as well. Undoubtedly, Germanys super weaponsspecifically those they were perfecting in the closing months of the warwould have defeated the Allies and helped Germany conquer and rule Western and Eastern Europe, suppress the U.S.S.R., and keep America neuteredeven with the new atomic weapon the U.S. had developed. But the Germans ran out of time. Some argue that no matter what the Nazis had, they could not have staved off American atomic attacks. And what of Hitlers alien double? It was said that after his suicide in 1945, it took 52 gallons of petrol to burn his corpse after death and that the one capsule of poison he was said to have taken was actually in reality repeated injections of Acid, Ethylene glycol, Digoxin and Hydrogen peroxide. It took four hours to kill the alien Hitler, and over 240 rounds of ammunition. It was later reported that the "thing" was screaming like some kind of prehistoric monster and the alien Hitler was lurching from room to room inside the underground Bunker in Berlin as the SS guards tried to end its life. Eventually the thing began to "smoulder" and "hiss" and a strange coloured odourless liquid began to seep from the creatures mouth. He was cremated outside in the Chancellery gardens and buried. It was said that when the occupying Russian forces dug up the grave when they arrived a few days later, the remains of the alien thing had gone and just a slimy liquid remained.